Business Capacity Management is concerned with understanding the needs of the customer in the future. It involves knowledge of strategic plans and trend analysis. This also links back to the Service level management process. These will be used as inputs to the capacity plan. The plan should be in technical terms. Resource Capacity Management addresses the capacity of technology being used. This includes hardware, software, network and infrastructure resources. 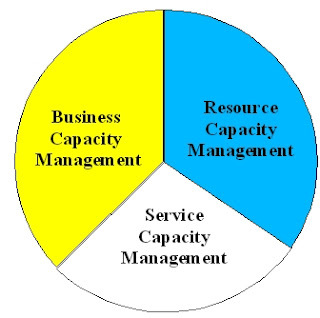 Service Capacity Management is concerned with services and non-technology resources. This includes personnel and current services being offered. These two areas have the same set of activities. The difference is in the resources that are being managed. Resource Capacity (RCM) looks at technology while Service Capacity (SCM) looks at non-technology resources. The first step is monitoring. Resources are monitored. Data based on its performance is stored in the Capacity Database (CDB). Reports are then extracted for analysis. The performance data is compared with the service level agreements from the Service Level Management process. Proposed actions are also identified to make the problem areas more efficient. Future load is also considered in this step and compared with current capacity. After analysing the data, the resource has to be tuned. Tuning involves managing demand either for the short term or the long term. The solution is then implemented. If the solution requires changes to or additional resources, these go through the Change Management process.